Ya go on vacation, and all sorts of interesting things happen. Before we can talk about the games on the court, let’s talk about the games off it…. Wiggins described what she said was a “very, very harmful” culture in the WNBA – one in which she contends she was bullied throughout her eight-year career. For instance, when we created a curriculum for early childhood students it included a character whose bullying actions escalated across a four-day residency. Because the bullied character often feels helpless, speaking up in their own defense is a huge hurdle. Our work looked an engaging the bystanders (the students in the classrooms) to 1) recognize the behavior of the bullies and the impact on the bullied and 2) move from a community of bystanders to a community of active protectors/defenders. As someone who semi-stalked the Liberty players during those early years, it was clear there were gay and straight women on the team. It also seemed clear, as far as I could tell, that the team was tight knit. There was also some “self-policing” when it came to public demonstrations of affection. I don’t know if this applied to the straight folks, but I do recall it becoming a bone of contention with one of the players and her partner in that she felt she was being silenced. Others on the team said it was not about “gay” or “straight,” it was about professional comportment. When I was fortunate enough to be able to cover the Liberty (and, occasionally, other teams), if players weren’t talking about the game on the court they were talking about being role models – both to the fans and to the up-and-coming players. Early on in the league’s existence, it seemed players themselves were reluctant to speak about their sexuality. No doubt, some of that was connected to league pressure (real or perceived). Some of that had to do with place and time – “what does who I love have to do with my missed free throw?” Some of it had to do with not wanting to expose themselves to scrutiny and its possible repercussions. Over the years, both society and the league have moved into a more open and inclusive stance. It seems like the younger players are more comfortable not only publicly acknowledging who they love, but actively engage the public in challenging discussions. Perhaps the dominant norm makes people uncomfortable – or jealous that attention is being given to someone else? Who knows…. 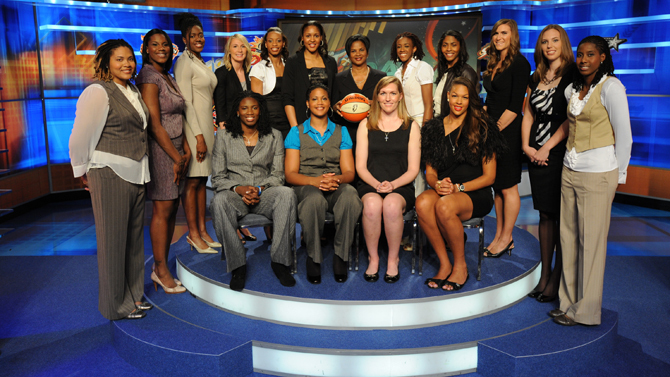 2008 draft included Candace Parker, Sylvia Fowles and Candice Wiggins. “Since 1996 when this league was founded, I’ve never in 20 years ever heard a player ever, ever, ever say anything remotely resembling what has been said by Candice Wiggins,” Auriemma said. First, I was sad because that was your reality. I’m sorry you were bullied and felt that way during your career. Bullying is serious and no one deserves it. I hope you know that says more about the people who chose to mistreat you than you yourself. I hope one day your love for this sport returns, even if only as a spectator. I don’t know you personally nor was I there so I can’t deny your experiences nor would I try to. But I will defend a league I grew up with and am now a part of. Have you or did you ever reach out to the union? Did you confront these women? Candice, I’m disappointed in you. We should be careful of who we allow to share our stories. We must be sure they not only respect the other parties but do their due diligence and only print facts. You stated that, “98% of the women in the league are gay” – that’s not only false but it’s unfair. You retired last year, have you met all 144 of us and been privy to our private lives? In your “research” did you really find only 3 women were straight? Do you know that orientation is not binary? Do you understand what you’ve done? You’ve reinforced unfair stereotypes. A person’s orientation is their own and their business. Now, because of your article, it is no longer out of bounds to ask WNBA players about their sexuality. Do they ask any male stars in the NBA about their sexuality? Is it even a conversation? I can say in my eleven seasons in the WNBA I’ve never witnessed the kind of bullying Wiggins describes in her interview. This does not mean it did not happen but I’m proud to be apart of a league that supports inclusion and celebrates all players regardless of their race, religion or sexuality. We are a family made up of players that love and respect the game of basketball. We are dedicated to growing the game and our league through integrity, honesty and hardwork. I feel awful that Candice had these experiences while playing in the WNBA but I encourage her to not only speak out about the negative aspects of her career but also shed light on how we can prevent this from ever happening again. Wiggins said that many players were jealous of her because she is “heterosexual and straight, and [is] vocal in [her] identity as a straight woman”. That perception of course looks to have severely shaped her experience in the WNBA. Well, I’m also a straight woman who was in a serious relationship throughout the course of my 6-year career (which would qualify as being “vocal in my identity as a straight woman”) and never ONCE was there an issue with that. Never once was there any form of jealousy or bullying. My boyfriend and I were not only welcomed with open arms but we both spent significant time with my teammates off the court. Is it possible that I was the exception? Hardly. DeLisha Milton-Jones, who won two WNBA titles and appeared in more games than any player in league history, said she was baffled by Wiggins’ remarks. “I know Candice as a sweet, intelligent young lady,” said Milton-Jones, who now is an assistant coach at Pepperdine. “I don’t want to take anything from her experiences while in the league, so I can only speak for what I experienced firsthand. And it’s in complete contradiction of what’s been stated by Candice. The 31-year-old WNBA veteran was surprised to see the notifications on her phone last week. Something had happened to former WNBA player Candice Wiggins. She got her son settled in his high chair with cereal and apple juice and opened her laptop. The story was everywhere. Wiggins told a newspaper in San Diego she had been bullied for being a straight woman in the WNBA, adding that the league was a “toxic” environment for her. The veteran read the story twice, then three times. …the other thing about this is that it – I just have to say, this sort of demonizes LGBT people. Again, the idea that they were in this league as sort of predators and people who were mean to straight people and, you know, had formed their own kind of culture – I think those are really damaging stereotypes. And there’s been nothing that I’ve seen in covering the league since it started that would corroborate those. My second “What the hell” moment was when Baylor coach Kim Mulkey spouted off. What? Baylor Women’s Hoops Coach tells fans to Punch Baylor Critics?? I call bullsh*t. You put your University over your students. You want me to believe differently? Get your azz on the front lines and advocate for a clear, transparent vetting of your athletic department. Strong comments from two strong-willed women, each making some valid points. And if Mulkey accurately sums up the exasperation many feel in wanting to move on, perhaps she can use her considerable influence in the Baylor family and among leadership to prompt the answers that faithful alumni such as Trotter say are overdue. Mulkey may be “in the know,” but many are not. Nor are many likely to move on so long as doubt about Baylor’s past dogs its future. Okay. Now that we got that off my chest, let’s get back to celebrating the game on the court. I do know the boys are waiting…. Yup, February Board of Ed Break in NY means it’s time for my annual SCUBA trip. Off on Saturday and back on Saturday. Please don’t start the impeachment hearings until I get back. Listen Up! Lachina: Rebecca Lobo chats about UCONN’s 100th consecutive win, being a part of the Huskies family, Geno Auriemma’s coaching legacy. Breanna Stewart talks about her journey to China, how offseason changes alter her role on the Seattle Storm, and what she plans to do for an encore in the year ahead. Harvard coach Kathy Delaney-Smith, the winningest head coach in Ivy League history, talks about fighting Title IX battles in the 1970s, her career arc, how the Ivy League has developed, her young, talented 2016-17 team, and where the game goes from here. Listen Up! College Sports Now and Rebecca Lobo. Rider continues it’s nice run in the MAAC, defeating Marist, 65-46. Don’t want to ignore the #2 Terps, even if they’re whomping Wisconsin. Ohio State looms. Welcome to #24 Kansas State’s season – they get back into the poll, they get whacked. This time, it was a stumbling West Virginia doing the honors, 66-59. With Maine and Albany having “transitional” seasons, New Hampshire is stepping into the void. They’re at 12-1 in the Am. East, and my Durham friends have noticed! Belmont has moved to 14-0 in the OVC. Say who? Western Illinois defeated South Dakota State. In his fifth year, coach JD Gravina’s team now sits atop the Summit. Colorado State repelled Mountain West challenger Wyoming, 61-54. A tougher loss for the Cowgirls: Junior guard Liv Robert out with an ACL. Yes, Tennessee lost to Alabama, but let’s not bury the lede: Diamond took a whack to the head/neck and was taken off the court on a board. Sounds like she may be okay, but head-neck injuries are no joke. Another significant injury: Shakayla Thomas’s shoulder put her in a sling. Wheels fell off #4 Florida State wagon and Virginia’s up and down season had an up(set). Cavaliers over the Seminoles, 60-51. Hmmm… what’s up with #3 Mississippi State, looking ahead to the conference tournament? They’re lucky Georgia ran out of gas in the fourth – Bulldogs win, 58-49. JINX! (Sorry Kim). #2o Michigan falls to Indiana, 72-61. #23 TAMU continues to confound. They lose to LSU, 67-63. The WWC continues to try and keep it interesting: Loyola Marymount over Saint Mary’s with authority, 72-57 (Remember – LMU beat BYU) and USF beat Gonzaga. Wright State and Green Bay are heading to a showdown Feb 24th. That likely will be for Conference Tourney seeding – and some “wanna go to the NCAA tourney” mojo. Speaking of showdowns, Western Kentucky got the season sweep over Middle Tennessee. C-USA tourney ought to be fun…. Ouch – Montana State (11-3) loses to Portland State (5-8). You might have heard that Connecticut is still unbeaten in conference play — and every other kind of play. Maryland and Texas are similarly making runs at conference perfection in the Big Ten and Big 12, respectively. But those three giants aren’t alone in their excellence. With only a handful of games remaining, Belmont (Ohio Valley), Drake (Missouri Valley), New Mexico State (WAC) and Penn (Ivy) are also close to wrapping up unbeaten conference seasons. The biggest problem for Kim Barnes Arico these days: Everything may be going a little too smoothly. Her Michigan women’s basketball team is 21-5 overall, the best start in program history. The No. 20 Wolverines are 10-2 in the conference with four games remaining and can clinch the No. 3 seed or higher in the Big Ten tournament with a win at Thursday at Indiana. Only twice in program history has U-M finished the conference season in third place or higher. So what’s she worried about? Staley’s crew has heard from the online critics who panned what the team didn’t do at UConn. “We do got a lot of coaches out there that want to coach our basketball team,” she quipped. “But you can’t just coach on game days. Got to get in here, got to coach on waking up, losing to a team and then getting them back, psychologically. It involves stressing to the team that a championship can still be won without putting undue pressure on it. Congrats: Texas named NCAA Team of the Week. Ciao (Thank you for the memories Bria Hartley! and welcome (An Elena Delle Donne and Emma Meesseman frontcourt will open up the Mystics’ playbook this season) from Bullets Forever. Talk about a Super Monday! #10 Texas and #4 Florida State started off the night in style, as the Longhorns battled back from a deficit, got the lead only to see a clutch three from Leticia Romero send the game into overtime. Two extra periods later (and far too many missed free throws, kids! ), the Longhorns earned the 92-88 victory. “To be on the road in this type of environment and have the adversity — we had a lot of people in foul trouble — I thought our team showed a lot of toughness and resiliency,” Texas coach Karen Aston said. The Texas Lady Longhorns traveled all the way to Tallahassee on short rest, played a 50-minute, double-overtime game last night, and came out 92-88 winners over the No. 4 Florida State Seminoles. Did you watch? I admit I meant to and forgot. So today I’m committing, for the next few weeks, to relegate the men’s squad to second-affection status and hop on the Lady Longhorn bandwagon. Next up, South Carolina pushed UConn on a night the Huskies should have been vulnerable. Nurse was hampered by a bad ankle, Samuelson was shooting blanks, and Collier was garnering fouls, and yet… Gabby Williams. Somehow, some way, the Huskies scratched out the 66-55 win and upped their record to 100 in a row. Both teams missed shots they might make other nights, but it was South Carolina that made the mistakes — committed the turnovers and gave up the rebounds that decided the outcome. Connecticut didn’t beat itself. And no one else has proved capable of it. She paused for a beat, then almost whispered the final two words again. Every time. One hundred times in a row, for those counting. It was working. The system was working. But Connecticut disrupted a lot of systems in winning 99 consecutive games, and did it again in defeating No. 6 South Carolina for its 100th. The Huskies (25-0) beat the Gamecocks 66-55 on Monday to extend their record for consecutive victories and let USC know that stopping them is a temporary solution. Four months later, UConn remains in Fantasy Land. Also from Richard: UConn’s 100th-Consecutive Win is Highest-Rated College Basketball Game on ESPN2 This Season UConn-South Carolina women’s hoops drew an 0.9 overnight rating, highest-rated CBB game on ESPN2 this season among men’s & women’s B-ball. “We’re one injury, couple fouls away from just being average at best,” Auriemma said. So on a night when the UConn women’s basketball team stood under the bright lights with a celebrated milestone in front of it, Auriemma saw it unfold. One of his starters was hampered by an injury, a few of his core players picked up some untimely fouls, and his best scorer was simply not scoring. Just in case the stat line of Gabby Williams wasn’t impressive enough during the UConn women’s basketball program’s date with destiny, her Hall of Fame coach bestowed the compliments to end all compliments on the junior forward. Not long after his team became the first NCAA basketball team to win 100 games in a row with a hard-earned 66-55 victory over No. 6 South Carolina before a sellout crowd of 10,167 at Gampel Pavilion on Monday night, UConn women’s basketball coach Geno Auriemma compared Williams’ majestic performance to the most offensively-talented player to suit up for him. “You can’t explain Gabby Williams ever having any expectations of ever being Maya Moore and (having) a Maya Moore performance tonight exactly when she needed it, exactly when it needed to be done,” Auriemma said. Beth Maiman, NCAA.com: UConn women’s basketball: What was happening in the world the last time the Huskies lost? A 100-game winning streak is not supposed to happen in any sport at any time. After all, there are salary caps, scholarship limits and parity-inducing draft orders in place to check such power, and that’s not even accounting for random factors such as luck and poor performances on any given day. That’s what makes the Connecticut Huskies’ 100th straight win—which they notched Monday with a 66-55 victory over South Carolina—downright incredible. Injuries, strong opponents and even the graduation of superstar Breanna Stewart have not slowed them down, and a fifth straight national title seems like an inevitable conclusion to this ride. South Carolina women’s basketball largely played the game it needed for the first 18 minutes Monday night against UConn. But the rest of the game served as a reminder of why No. 1 UConn was playing for the first 100-game winning streak in Division 1 basketball history — and why the Huskies got the job done in a 66-55 win against No. 6 South Carolina (21-3, 11-1). The University of South Carolina women’s basketball team will be a footnote in the history books. The Gamecocks suffered a 66-55 loss Monday night at the University of Connecticut. It was UConn’s 100th consecutive victory, the longest streak in NCAA history in any sport. South Carolina may find no solace in the undesirable distinction of being UConn’s 100th victim. Yet, the Gamecocks are a fitting foe for the milestone. South Carolina is ranked No. 6 in the USA Today Sports coaches poll. Even amid the conference schedule, both teams eagerly relished this enticing encounter. UConn has never cowered to protect its streak. Good Men Project: Who Runs the (Basketball) World? U Conn.
To get more specific, I think a lot of times people look at UConn women’s basketball and are not interested in particular players and their stories. These are really fabulous women who are going to rule the world someday. They are great students, leaders, and are excellent citizens of the community. I’d like to see a lot more emphasis on individual players and their achievements in addition to the team. At first, Rama N’diaye kept a secret from her loved ones and entire support system last summer: She had breast cancer. Privacy is the cultural norm back home in Senegal, yet N’diaye quickly realized she would need everybody cheering her fight. She gathered the courage and reached out to former California basketball staff member Sarah Holsinger, now at Virginia working as associate athletic director of basketball administration for Joanne Boyle, the coach who recruited N’diaye to Berkeley more than a decade ago before leaving for Charlottesville.